Sea lamprey invaded the Great Lakes during the 1800s through manmade locks and shipping canals. Prior to the opening of the Welland Canal in 1829, and prior to its modification in 1919, Niagara Falls served as a natural barrier to keep sea lampreys out of the Upper Great Lakes. Did you know that the average sea lamprey can eat up to 40 pounds of Great Lakes fish? If the lamprey does not kill the fish directly, the fish is often left with wounds susceptible to disease. For fifty years, sea lamprey assessment crews have been monitoring adult sea lamprey migrations in spring and early summer. Mechanical traps and nets are used to capture the sea lampreys and biological information is recorded to understand population characteristics. 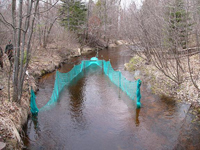 A mark-recapture study is conducted on each stream to develop stream and lakewide population estimates. Part of a successful sea lamprey management program is understanding how many spawning-phase sea lampreys are in the lake and where they are. This is where you can make a difference! With your help, we can learn where lampreys are and better target control. So, please log-in and enter your spawning-phase assessment information. Check back regularly for end of year reports. 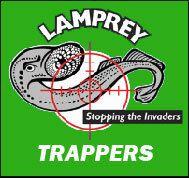 We appreciate your participation in the Lamprey Trappers program.